It's a little after 8 a.m. at Wakefield High School in Arlington, Va., and Michelle Harris' AP Environmental Science class is getting right to it. "All right, you guys got your brackets out?" Harris asks. "We're going to jump down to the fourth-seeded spider monkey against the 12th-seeded antelope squirrel," Harris says. "Spider monkey better win!" one student shouts from the back of the class. 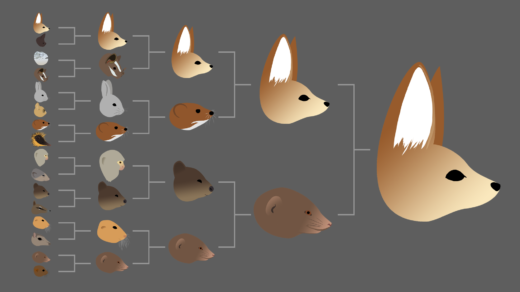 This is March Mammal Madness: Round 2. It's a competition that has been playing out online and in hundreds of classrooms over the past month. Real animals wage fictional battles, while students use science — a lot of it — to try to predict the winner. March Mammal Madness was created five years ago by Katie Hinde, an evolutionary biologist at Arizona State University, though now, she says, the competition depends on a whole team of volunteer scientists and conservationists: biologists, animal behaviorists, paleoanthropologists, marine biologists. Hinde's team meets every year for a Selection Sunday of its own. Team members pick the animals that will compete and even decide who will win, though they keep it a secret. That's because a whole lot of research has to be done. Each scientist is assigned a specific battle, then studies up and writes a battle story based on facts. "Then the battles are live-tweeted as a dynamic, play-by-play story, much like someone would watch a basketball game," Hinde says. Those tweets link to scientific articles, videos, photos, fossil records — whatever the team can use to drop knowledge into the story. That's why so many teachers, including Michelle Harris, have begun using the brackets in class. As in basketball, there are plenty of upsets and broken hearts — like the time a snow leopard and a flying squirrel faced off in the rain forest. The snow leopard overheated and lost. Or the time tourists used their human junk food to lure an adorable quokka off the playing field. "Sometimes animals can displace one another. Sometimes animals can hide, animals can run away. Sometimes they get eaten. Sometimes they actually engage in contact aggression," Hinde says. It's a little ridiculous, but she says the point is to have fun while also creating a learning opportunity. "We really try to showcase animals that people might never have heard of," she says. "Like dhole and bandicoot and binturong and babirusa." At Wakefield High, Michelle Harris is going over the tweets from one of the previous night's battles: the No. 6 seed tiger versus the No. 3 seed leopard seal. "And apparently we need to bundle up," she tells the class, "because we're headed to the vast coastal ice flows of Antarctica!" Near the back of the class, senior Jordan Simpson giggles with Tiara Jones, both looking at a computer screen. They've Googled the bilby, a tiny Australian marsupial with big, rabbitlike ears. Simpson says she picked it to go all the way. "I thought it was cute," she says with a laugh. "I knew it had no chance, but I thought I'd give it a shot." Jones bursts out laughing. The bilby was ousted in the first round by a Tibetan sand fox. Harris says those fits of giggles are a big reason she uses the bracket in class. "This time of year can be a little stressful as we're leading up to AP exams, so it's nice to have a little bit of fun along the way," she says. That's Hinde's ultimate goal, too — to make science fun. "I think it's a chance to return to that time when science was all about the imagination and the wonder at the natural world," she says. "Science is narrative, and that is incredibly salient to the human mind."